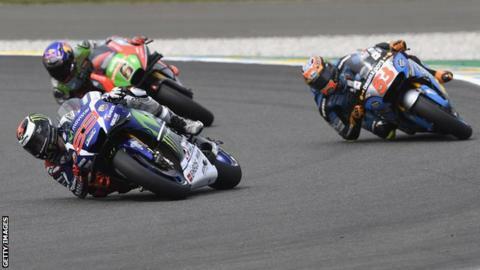 Spain's Jorge Lorenzo has taken over at the top of the MotoGP standings after victory at Le Mans. The Yamaha rider, 29, led from pole position to finish 10 seconds ahead of team-mate Valentino Rossi in France, with Suzuki's Maverick Vinales third. Ousted championship leader Marc Marquez crashed - as did eight others - but the Honda rider remounted to finish 13th. Lorenzo now has 95 points to lead the standings by five from Marquez.